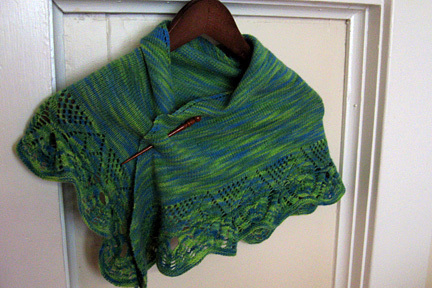 This shawl was knit in Classic Merino Lace from Knitting Notions (its dreamy soft!) on size 4 needles. I had purchased 2 skeins, which equaled about 770 yards, and I only used about one and a half. You can certainly use thicker yarn with a corresponding bigger needle. 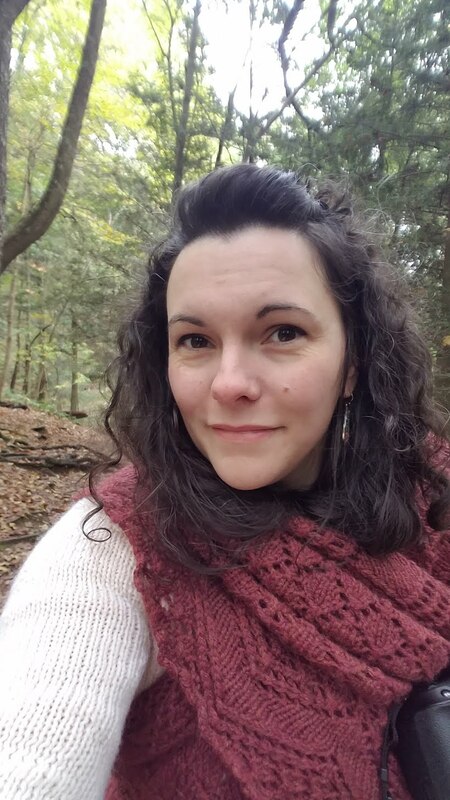 If you want to make this more shawl-like, you can do a bit of math to figure out the final total of stitches you’ll need before beginning the edging (which is over 21 plus 8 stitches). Begin by casting on 7 stitches. Knit one row, placing markers as follows: K2, place marker, k1, place marker, k1, place marker, k1, place marker, k2. 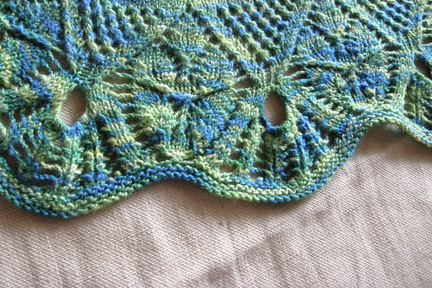 These first two and last two stitches are your edging, and will always be knit. You’ll repeat these two rows over and over and over again until you reach a total of279 stitches on your needles. On your next row, you’ll k2, slip marker, YO, knit all the way across until the last 2 stitches (you are NOT increasing in the center), YO, slip marker, k2. This brings your stitch total up to 281. Do one last repeat of row 2 for your wrong side, bringing you back to the right side. From here (and the reason why I consider this a pseudo pattern seeing how I just kinda pieced things together), you’ll need to follow these lovely instructions at Yarn Over, starting with row 10. Knit through row 50, and then bind off. Soak, block, and you’re done!